Recently I was given the opportunity to try and test out the VacuPractor , a safe at home alternative to reduce my, lower back pain. If your like me or have a family or loved one who is a back pain sufferer, you know first hand how crippling it can be. I have spent my share of countless days of not being able to move, sit right and say no to doing things with my family and friends. All due to back pain ! 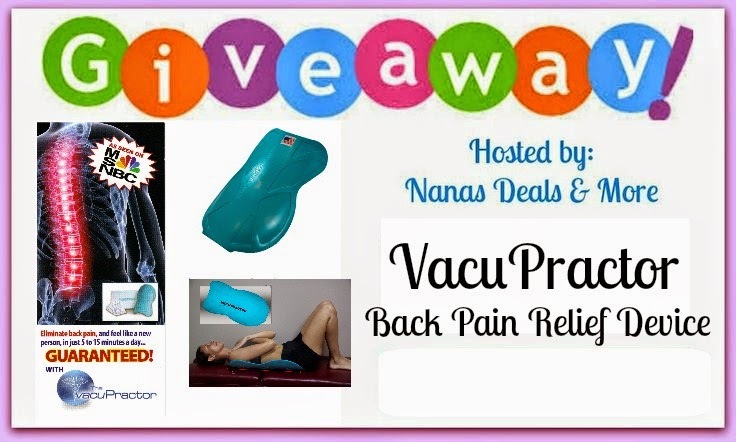 Let me tell you that the VacuPractor, is a life changing, safe and easy to use lower back pain solution you'll love that does not cost an arm and a leg ! And you have it to use over and over again as you need too !!! Use it at home or wherever you are and in just 5 to 15 minutes your back pain will be gone. True Fact: Americans spend over $50 billion dollars each year on lower back pain, a leading expenditure of health care dollars in the U.S. It is the most common cause of job-related disability and a leading contributor to absenteeism, affecting more than half of all working people. One quarter of U.S. adults reported having lower back pain, lasting at least one day in the past three months. Back pain is the second most common neurological ailment in the United States. Only headache are more common. As a Nurse, I am one of those job related back pain patients. When I have back pain, and I can't move, walk or even sit in a chair comfortably- how can I possibly go to work or drive? I've lost time off from work utilizing my sick days because of it. Or forced to go to work and suffered horribly all day, not giving my 100% to my job, and only to end up on the couch with heating pads or paying out of pocket for a doctor or chiropractor visit ! I "LOVE" how it works and I "LOVE" that I didn't need to take any OTC or RX Pain meds !! And in about 10 minutes I was pain free again! Thank you to the great folks over at VacuPractor for creating something we can all afford to use at home, to be pain free ! Check out the video below to see how easy it is to use! I know your probably thinking does this really work? I am here to say " YES" it worked for me and others that I let try it out. My daughter who is only twenty-six , has been suffering from sciatica, and this normally lands her out of work for a few days and into the doctors office. It happened to be that she felt the oncoming flare up, so I asked her try the VacuPractor out . She reported feeling like the pressure was gone and she slept through the night and then to work the next day. That normally would not have been the case, had she done the same routine of laying on a couch with a heating or ice pack. She is now a firm believer in the VacuPractor. You can read honest testimonials of others who have and use the VacuPractor here. VacuPractor has been seen on MSNBC and many media magazine publications. Try it out for yourself and see, if you or a loved one is suffering from back pain - put a stop to it today. The VacuPractor is so easy to use and you can take it with you in your car, to the office, on vacation. Its light weight and can pack inside a suit case ( yes I tested this too). The next time your on a trip and have a back issue, don't cut your vacation short - use the VacuPractor ! Try it at home risk free with our 90-day money back guarantee. The great folks over at VacuPractor are letting me giveaway (1) VacuPractor to one lucky reader. Giveaway Opens 8/28/14 to 9/9/14- Also we will be posting reminders during the promotion on this blog, our social media outlets and e-newsletter. Use Entry Form Below to Enter. Also by entering this giveaway you agree to all terms and conditions below and on entry form. Good Luck !